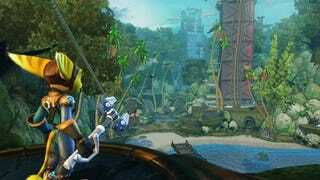 Ratchet and Clank: Quest for Booty will be hitting PSN pretty soon. By now, you're all familiar with the details since its E3 announcement. A short but sweet extended expansion for Tools of Destruction for a low, low price of $15. I got a demo of it today, and while it's a PSN-only download game, don't expect the graphics to take a hit, in fact, expect to see some improvements. It's a wonder how Insomniac finds the time to make Resistance 2 and sprinkle on a little Ratchet and Clank in the same year. But they did, and boy you really have to hand it to them. Sure Quest for Booty is a short game, around 4 to 5 hours, but it still looks as good as any other game out there. It uses the same engine as Tools of Destruction, which Insomniac knows like the back of their hand, and that allowed the team to add some new lighting and environmental effects for new areas of the game.Something I didn't really love about the later Ratchet titles was the focus on weapons. I like more platform-y games. So I was excited to find out there is less emphasis on weapons this time and more placed on platforming and puzzle solving. Ratchet doesn't even start with a weapon; you have to wack stuff with your wrench early on until you find one. The level I saw didn't showcase it, but the theme of the game is about pirates and swashbuckling, so that's pretty exciting. I mean, pirates are awesome, right? The gameplay itself is straight-up Ratchet, though. If you know the series, you'll feel right at home. I was told Insomniac wanted to release this to get people to try Ratchet who didn't before and who are new to the series. How that translates into the overall difficulty of the game remains to be seen. Also, there are no trophies in this game, at the time of launch anyway. There's nothing stopping them from adding them in down the road, however. No saved data info from Tools of Destruction will carry over into Quest for Booty, either. They wanted to make this a completely separate experience. One little hint was dropped to me about the ending. I had asked if the storyline for Quest for Booty would carry over into the next Ratchet game. I was told you're going to have to beat the game and find out and that there may be something interesting. Don't take that as any kind of confirmation, though.